This past weekend we took Hunter out for her very first camping trip. I needed the perfect project for the trip. There was a little driving to get there but mostly there was a lot of hanging out by the campfire so it would have to be something worthy of a fair bit of knitting time. By the way, some might have worried about smoke flavoured knitting but I figured I would just give it a soak and it would be none the worse for wear. I needed a project with a pattern that was easily memorizable (sorry Rock Island, you had to stay home) and something with a thicker yarn, no lace for this long weekend. 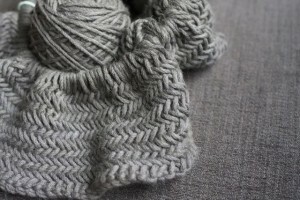 The perfect combo for me was the Big Herringbone Cowl from the Purlbee. The combination of a nice textured stitch, big needles, and my all time favorite yarn (yes, I realize this title changes from time to time) Blue Sky Alpacas Worsted Hand Dyes. The pretty charcoal grey with the herringbone stitch is such a wonderful combination it’s like knitting hot chocolate, warm, comforting, and cozy. I had some 12mm needles from my various Twinkle cowls but they are unfortunately a bit short. There are a lot of stitches crammed onto those bad boys! I recommend you pick up 5 skeins, some giant needles (24 or 32 inches rather than 16) and check out the pattern for the next long weekend camping trip! This entry was posted on Monday, May 23rd, 2011 at 10:39 pm	and is filed under Uncategorized. You can follow any responses to this entry through the RSS 2.0 feed. Both comments and pings are currently closed.